We’ve had a membership for over a year, it’s a great escape for parents and all adventure for the kiddos. A safe, learning, but fun environment for our 3 yr old (who seems to never tire of it) and an excellent way to sit back and relax a little as a parent. The toy borrowing is brilliant. It keeps the clutter at home down, since you check out toys, then bring them back when the little ones get bored with them. We rotate in and out about 3 toy sets, instead of the mountains of unused plastic crap we used to have all over the house. Toybrary also has some very cool events for kids and for parent-kid participation – reptile experts with their pets, story time, crafts, sing alongs, and of course you can have birthday parties there. It’s a no-brainer for kid activities that reduce mom and dad’s stress! The second I met Ms. Liza Wilson at Toybrary Austin, I knew we would be buddies! She is ALL for what’s best for kiddos and the way they learn and develop…which is why she let us have REAL worms today in class! And I can’t thank her enough for always having an open door and open arms when it comes to my very own boys! Hugs and High-fives to you, Ms. Liza! Thanks for always supporting Mommies and their Little Learners! Caroline and Greyson went to Toybrary yesterday for the first time and we fell in LOVE with the space. Cute fun toys to play with, toy rental so you don’t have to buy and buy and buy, so many cute classes and drop-in child care . We have been homeschooling all year and it is awesome! Toybrary Austin has been a significant advantage in getting my thriving little student engaged in her learning environment! Last year was my first year to use the Toybrary. I enjoyed the “shopping” experience and being able to find study theme-related activities to supplement my personal collection. My students were always excited to see what fresh new activities I would bring them whether they supported sensory, literacy, fine or gross motor, science or math learning objectives. Liza knows what kids love. She has created a warm, inviting space to share and grow! There’s no place like Toybrary! I’m so glad I to have meet Liza and be a part of her dream of filling classrooms with quality, educational materials. I just opened a small preschool from my home, in August 2013, and Toybrary has been such a blessing. Being able to have new materials on our shelf, and change them out often, has helped me save so much money and keep the children engaged. Her set up is beautiful and welcoming, the materials are easy to find and kept in great condition. Thank you for helping us add that extra fun to our shelves. There are so many choices, for a teacher there’s no way I could have all of this inventory. The toys are updated often, there are always new things to check out…There are so many activities–I tell my mommy friends about all of the activities, like the music classes. It’s a great resource and I love it! This is such a clever idea, one I wish I had come up with. This is a relatively new business run by a one woman show, Liza. I love being able to drop in and chat with other moms. The colors and decor are bright and welcoming, it is big enough that the kids have room to play, but not so big that you have to get up and keep checking on them. We are living in an RV right now as renovations are completed on our house. I am grateful I don’t have to go to the $1 store to buy dinky plastic toys. Instead I can check-out quality, age appropriate toys that we use and return when we are ready for something else. This is on of the most environmental moves you will make for your child. Another discovery are the toys I would never have purchased for my 3 year old son: lacing beads, kitchen play-sets and the stage with costumes. The combination of classes and activities change weekly. This is one of the brightest spots of our week. You know something good is going on when your child keeps wanting to go back time and time again. Ask for this as a Christmas gift for your child and stop getting crazy huge annoying toys from grandparents! What a great find!! I have 2 children 2 & under so finding something that engages both of them is rare. Shelby loves all the different toys and all the kids she gets to meet. There is almost always other playmates around. We are always warmly greeted by Liza, she engages with Shelby and always has a snuggle for the baby. The toybrary has toys for up to 6 years old and Shelby explores every one! I LOVE the fact that most of the toys are wooden or made of something other than yucky plastic! Liza is a wonderful ally to fellow women business owners. There is always something on display from a local mama. She hosts several classes a week including tot yoga, art and learning a different language. We love to come here just to play! Hopefully we will see you soon! Love this place! Even though my tot is older, there are tons of great classes that she can attend. The space is so well thought out, and the owner really caters to both the child and mom, which is hard to beat. I love that I can also get my child a snack or drink if I want to. The owner is friendly, always asks my child questions when we come in, and has a lot of experience working with children. It’s a great concept and Austin needs a place like this! They have snacks and juice available, and are always hosting something cool. We’ve seen a balloon artist and taken a jewelry class – both of which my older ones enjoyed, too. I love it that they have a few unique things for sale and they gift wrap, too! It’s a brilliant idea and has a good vibe – check it out when you can! Toybrary Austin is such a great addition to Austin! The selection of toys is great and can be fun for people of all ages. I traveled to Chicago a few months ago and visited the planetarium because I am a star gazer. I was delighted to check out Toybrary Austin’s Constellations Memory Game and had such fun with it! The ambiance is colorful and inviting and I’ve seen many children visit and have a blast deciding which toys to check out. Usually my son has a little TV show that he watches, but when we got home from Toybrary with his new toys, he completely forgot about the show. He and my daughter played with the handbells for about 45 minutes. It was beautiful. Then he cut with the wavy scissors for a while and was sad when it was time to return them! Austin Toybrary is run by an outstanding team of passionate, socially-conscious people who love helping kids learn and grow. 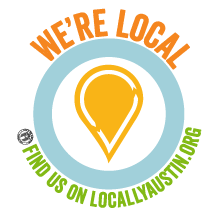 And their business model is the best kind there is: the more successful Austin Toybrary becomes, the more everybody wins – kids, parents, and the Austin community as a whole. I am a speech and language therapist in the Austin community and LOVE the resources at Toybrary. As a service provider to children ages birth to 5, Toybrary Austin keeps my therapy sessions fresh and engaging. The wide variety of toys leads to many avenues when working on goals/objectives. I have found ways to include expressive and receptive language activities in products I have borrowed from this toy library. Liza has many language rich fine motor activities as well. I highly recommend all home-based therapists to give Toybrary a try. I’ve told so many people here in Austin and as far away as North Carolina and Oregon about your business, what a great idea it is, etc. The out-of-staters say they wish a Toybrary was near them. Thanks so much for all that Toybrary offers. It’s been great to be a member. Jade has benefited so much. Toybrary is a favorite place for the kids. You have a knack for scheduling some really fun events. Liza warmly welcomed our Homeschooling group into her Toybrary family just a few months ago. And each time we hold our monthly Reader’s Theater club there, it’s a HUGE hit. Everyone leaves with a great experience and smiles on their faces! When I walked into the Toybrary for the first time, I fell in love! I fell in love with the cozy colors, the creative atmosphere and the happy sounds of children playing, learning and laughing. I stood in “AWE!” at all the amazing resources that WE have access to at the Toybrary. Our children see these resources as toys; parents should see these as educational tools! From literacy learning to math manipulatives, this happy place has got it all! Liza has organized ALL the materials perfectly. It makes it easy to Grab, Go and Learn for me, as I am a homeschooling mother of 3! Looking forward to learning, sharing and playing for many more years at the Austin Toybrary. We started going here for a weekly playgroup. But my girls loved it so much we ended up becoming members. We live south so it’s kind of a long ride for us. But let’s face it. In this heat, some nice a/c while your kiddos can run around is priceless. Worth it for us! We go every Tuesday for playgroup and so the twinks can pick out their new rentals! I have been trying to visit this place since I first heard about it from a group of moms. While we are not really interested in the monthly membership (we live a bit far), I was still pleased to find out that you can stay and play for only $3!!! They had all kinds of toys for my 15 month old to play with that we don’t have at home. The day we went, they also had a bubble class going on but my daughter was more interested in the bucket of soapy water than actually seeing the different ways to blow bubbles. lol. None the less, she had a great time running from toy to toy every 5-10 minutes and making a few new toddler friends while we were there. We stayed for over an hour and will definitely be revisiting. This is exactly the type of place Austin needs for its very young crowd…a safe, happy, tot-friendly place for kids to explore. I live in South Austin but have made it up to Toybrary several times since there is always something awesome going on there! I am amazed that it is run by one person. Liza keeps the place colorful, clean, and entertaining. There are fun events occurring here daily– some that my 3 year old and I have attended are shows for local kids musicians, balloon artists, and face painting. We even attended a super fun birthday party here too…all the kids had a blast. Great spot for a play date too! They had a good selection of toys to play with; playhouse, ride on toys, bikes, dress up clothing, kitchen, magnets, wooden toys, real metal mini shopping carts, a slide and many others. Also comfy chairs for the parents. The bathroom was stocked with a mini potty toilet ring and diapers. Sweet touch. Liza let us run free and didn’t hover. Kiddo had a fun time and it was $3 well spent. We will be back for future open play and some of the fun events they have. Look forward to coming back. It was like discovering a jewel. We absolutely love the Toybrary. Not only is a great for the kids to play, the toy selection is superb. Liza has created a space for moms and kids alike to connect, play and learn. The Toybrary hosts many type of classes for parent and kids. I have even been able to get a little computer work done while my kids play. I highly recommend trying it out! Thank you for hosting us! Your Toybrary is wonderful and I am so glad parents have a place to gather! You have succeeded in creating a fun and safe gathering place for parents to get support for the challenging work of parenting and it is clearly apparent that you have a heart and a passion for the work. I am so glad you have chosen this path and I wish you every success! Thank you again for a fun time for Dimitri’s birthday party. Your space was perfect!!! You are the BEST!~ Thanks so much for being flexible!